King Felipe VI and Queen Letizia of Spain are headed to the United Kingdom for a state visit in 2017 after postponing a planned 2016 visit due to political difficulties. 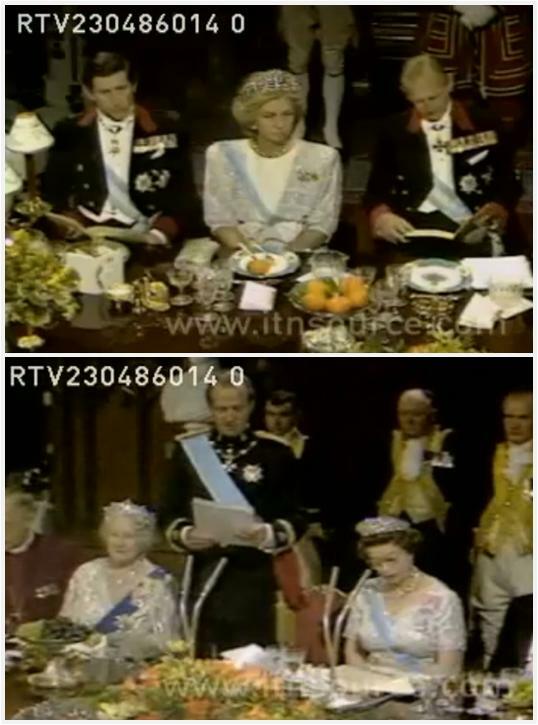 Two state visits happened between the two countries during the reign of Felipe's father, King Juan Carlos I: Spain to the U.K. in 1986, and the U.K. to Spain in 1988. The 1986 state visit took place in late April at Windsor Castle. ITN video screencaps. See video here. 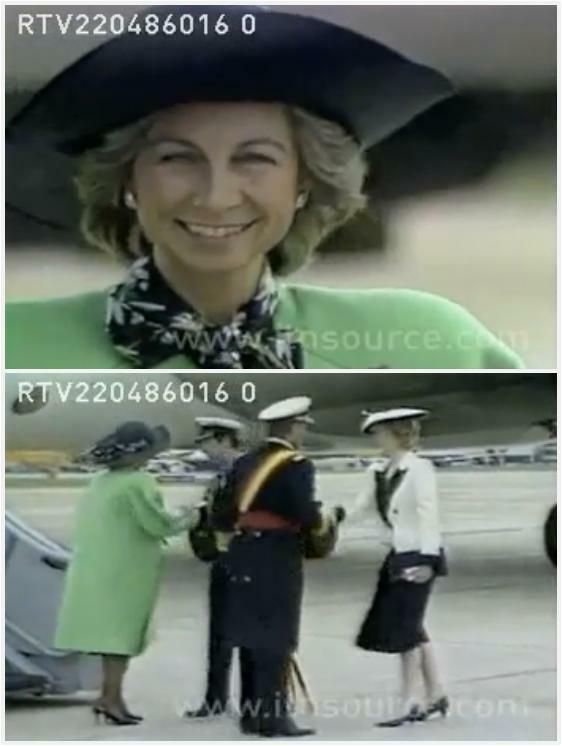 The Spanish couple were greeted on arrival by The Prince and Princess of Wales. Queen Sofia rarely wears hats, but on this occasion she chose to fall in line with what she knew her hosts would wear and donned a large black chapeau. The Queen greeted her relatives (Elizabeth, Philip, Juan Carlos, and Sofia are all descendants of Queen Victoria) wearing the Cambridge Pearl Pendant Brooch. For the evening state visit, QEII pulled out one of her favorite combinations: Queen Alexandra's Kokoshnik Tiara, the Greville Chandelier Earrings, the George VI Festoon Necklace, and the True Lover's Knot Brooch. Queen Sofia brought her best and brightest as well, wearing the massive Fleur de Lys Tiara. On this occasion, the sovereigns awarded each other orders that are not the highest rank for their respective countries. Juan Carlos was given the Royal Victorian Chain (he's wearing it around his neck in the photo above); Elizabeth was given the Order of Carlos III (which she wore with her Royal Family Orders). They awarded each other higher orders later. Prince Philip and Prince Charles both received the Order of Carlos III. (You can see Philip also wearing the actual Garter from the Order of the Garter around his leg in the first state dinner photo.) Queen Sofia was not given a British order. The Queen Mother, who almost never wore foreign orders, was present in the Order of the Garter and the Greville Tiara. This state visit also included a white tie return dinner with tiaras. Pictures are harder to come by; here is one selection showing multiple family members in attendance (from both countries). The Queen wore the Grand Duchess Vladimir Tiara with pearls and Queen Sofia repeated the Fleur de lys Tiara. The Spanish state visit will be June 6 to June 8 July 12 to July 14, and we'll take a look at the 1988 state visit before then.